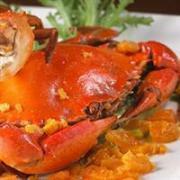 It’s crab season in Singapore and Café Mosaic at the Carlton Hotel is offering an all-you-can-eat crab buffet until October 31, 2011. Fresh Sri Lankan crab will be prepared in many ways including black pepper sauce, crispy crab tempura, and Singapore’s signature chili crab. The buffet is available 6:30pm – 10:30pm nightly and costs SGD78 (USD63) including a glass of Tiger beer or soft drink. Children age 5 – 12 will be charged at a reduced price of SGD39 (USD32) each. There will be no charge for children under 5 accompanied by a paying adult. All restaurant prices are subject to 10% service charge and 7% local taxes. Diners who pay with a CitiBank or UOB credit card will receive a 10% discount. Other dishes on the “Crab Fiesta” menu include crab in honey butter pumpkin cream, salted egg yolk crab, and Thai-style crab vermicelli. The buffet will include a variety of other dishes like salads, side dishes, and dessert. Visit the Café Mosaic website for more details. Reservations can be made by calling (65) 6311 8195 or emailing cafe.mosaic@carltonhotel.sg.